I just "designed" it in powerpoint quick, printed it out, cut it out with fancy scissors and inked the edges. They'll be staying in my craft room where the colour theme is purple (and butterflies), so I made the soap stickers to match. Oh, and then I'll be leaving my sis another little surprise under the duvet....hehehe! Who Made What? Weekends! Linky Party #7! PLEASE READ MY ONLY PRETTY PLEASE REQUEST BEFORE SUBMITTING YOUR LOVELY CRAFTS! I've simplified my rules, and all I ask for is this: Please link back to my post or blog (using my badge or just a worded link) in your post, otherwise your craft WILL be deleted - I'm trying really hard to promote my site, so I'll gladly advertise for you if you return the favour. :) It's just the nice thing to do...so it's nothing personal! If you notice your craft has been deleted, please try again as I'd love to have your lovely crafts here! Also, I started this party a little late today, so it will be carrying on through Monday too! I will feature my most favouritist creation submitted! So don't delay, submit today! :) I can't wait to see what you've all made! And the initial idea was to use different decorating techniques on each letter.....but alas.....I became lazy, but was also worried that any daring new techniques would mess up the little letters! So I just stuck to what I considered less risky crafting. This one isn't too terrific - the colours just don't match...I should have used orange glitter for the paw prints that I drew on (except I don't have orange glitter, yet). Also, the letter stickers weren't friendly to me. Some of them tore when I tried to get them off the sticker sheet, and that's why I had to glue blings on them, to cover up those tears. It was just the "O" that was in good shape. Anyway, I used spotted scrapbook paper, and embellished with a cool cat 3D embellishment from a sticker pack. And then at the last minute, I thought of 2 little mini pom-pom goodies that I had - had 'em for YEARS just stashed away in some box, I don't even remember where I got them from, but they were far too cute to throw away! And then, while I was peacefully going about my business of adding blings to the C, all of a sudden.....NOOOOOOO!!! Don't you hate it when that happens??! I just painted it pink, tied on a purple ribbon and glued on some purple blings and a pebble. But, it's still my favourite one! I painted it green, added a 3D flower embellishment from a sticker pack and drew on some swirly designs with my glue pen and added purple glitter. I love purple and green together! This one didn't turn out as I initially intended, so I improvised. I decoupaged some scrap material onto it. Then the material wasn't cut straight (or the glue made it go all skew, yep, this must be it), so I had to find a way of covering that up. So I added strips of ribbons over the parts where the letter was showing through from behind, and then glued on some pearls to the ends of the ribbons because they just looked.....bare. I'm not even sure what I was trying to achieve here, so......let's just move along, shall we...? I wanted something flowery too, so I glued on left over card stock, added some green glitter to the flower centres (ooh, just noticed I missed a flower there...ish), and added some paper flowers and leaves. I 3D mounted an extra flower on top of the lower ones, just to make it more interesting. * link back to the person who awarded you the badge! 1. 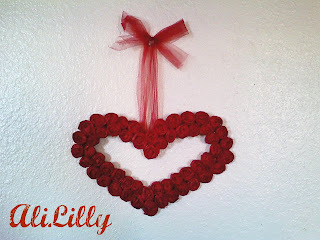 I'm an attorney by qualification, a business owner by profession, and a crafter by choice. 3. I love food. You can probably get me to do things I don't feel like doing by bribing me with some good (vegetarian) edibles. And I have an exceptionally sweet tooth - I always have space for dessert, no matter what! The only purpose of a main course is to get to the dessert. But I don't really like cooking or baking at all. 4. Some things that I wish were not about me, but they sadly are: I'm lazy...and I procrastinate things I don't like doing. I'm a very tidy and organized mind in a lazy body. 5. If I know I'm going to be staying home all day, I usually wear my jammies and slippers. Because they're comfy. And I don't really like wearing heals because I'm tall enough. 6. I don't easily get stressed over things that don't indicate the end of my world (unless it's public speaking). I'm a total phlegmatic (mostly). 7. Rainy days make me feel all fuzzy and happy inside. Just add some chocolates and I've got myself a perfect crafting day! Lots of lovely and inspiring cards! Delicious recipes are to be found here! Beautiful cards, some also made from recycled materials. Lovely crafts and cards. Plus I think she's funny! A collection of the most interesting, weird and beautiful crafts gathered from all over the net - very cool! Lovely cards, crafts, and delicious chocolatey recipes! And with a name like that, how could I not love this blog?! Lovely crafts & cute mini scrapbook albums, including albums made from recycled items! Lovely cards, scrapbooking and crafts! 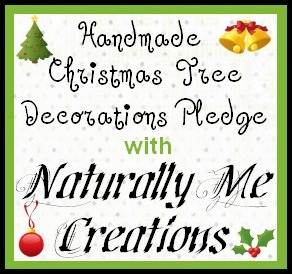 My Totally Handmade Christmas Tree Decorations Pledge! Featuring your lovely creations from Who Made What? Weekends! #6! 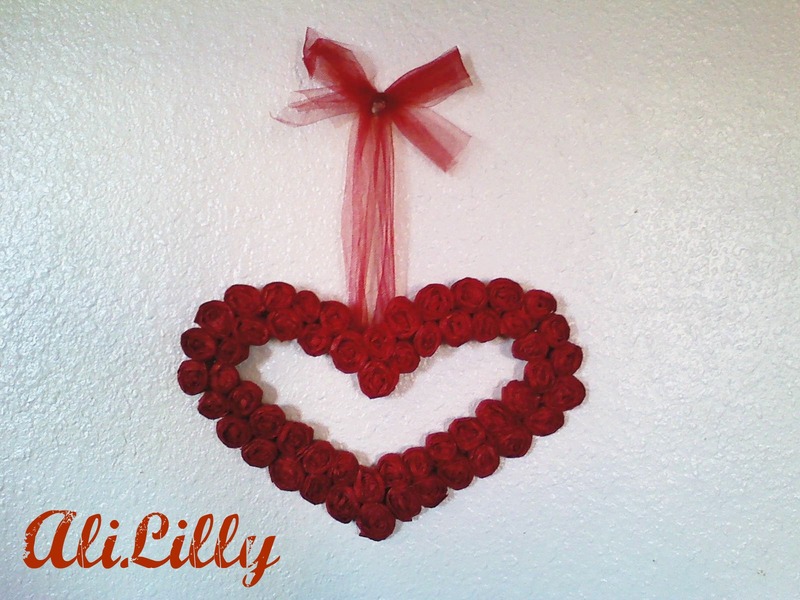 This week's feature is AliLilly's Valentine's Day Wreath! Go have a look at her blog and see what other interesting things she's up to! She also has an Esty shop where she sells, among other things, pretty little beaded jewellery! Remember to enter my Who Made What? Weekends! Linky Party this weekend! This card I made for Ladybug Crafts, Challenge #11! The theme for this challenge was "anything BUT square", so.....I did just that! I couldn't get the lighting right, it was either too dark or too bright, so I've posted both and you should hopefully be able to get the effect of the card when you combine them, hehe. As you can see I chose a circle card. I made a cute girly hearty one this time. I cut out a circle from white card stock using some handy circle cutter goodie, then I cut another scalloped circle out of pink marbled paper with my fancy scissors, another white circle and a small pink circle with polka dot pattern. The inside of the smaller white circle I stamped in pink ink with a small heart stamp all around the edge. I think it made a really pretty design! Then I inked the edges with a darker pink/red ink just to make it stand out a bit against the light background marbled paper. For the final decorations I added a pretty button in the centre with a shiny string tied through it, and some hearty and round blings around the card. Ladybug Crafts (Challenge #11) . I also discovered that you can't use a hair dryer as a heating medium for embossing...it seems it ain't hot enough. Boo. So I did it over the stove again! I stamped a design onto white card stock and inked the edges, added some paper flowers and blings.